What is a slow-release intraruminal Bolus or Capsule? A slow-release (or controlled-release, sustained-release, pulse-release, prolonged-release, etc.) intraruminal bolus or capsule (= SR-bolus, or SR-capsule) is a device containing an active ingredient, which is introduced into the stomach (specifically into the rumen) of an animal where it slowly releases the active ingredient. Such devices are used for delivery of parasiticides (e.g. anthelmintics) as well as several other veterinary medicines. They are mainly used on ruminants (cattle, sheep, goats). The term "bolus" is not specific for such slow-release devices. It generally refers to tablets for oral administration that are delivered to cattle, sheep and goats. Not for chewing or swallowing, but directly into the rumen with a special applicator gun. Classic delivery forms for anthelmintic active ingredients such as drenches often have a rather short residual effect, i.e. they kill the parasites "once", shortly after delivery. They offer little or no protection against re-infestations because they are quickly excreted, metabolized or otherwise broken down in the organism of the host. To protect livestock against re-infestations the animals have to be re-treated periodically. Slow-release devices overcome this problem by gradually delivering the active ingredient they contain along a pre-determined period of time of up to several months. There are various mechanisms by which the slow relase is accomplished. Some SR-boluses contain an osmotically driven mechanical pump, which once in the rumen of the host pushes the drug out of a reservoir. Such devices are mostly metallic. Other SR-boluses consist in a block of an inert material (e.g. paraffine) mixed with the drug. The mass is slowly eroded in the rumen and releases the active ingredient. Other SR-boluses consist in a series of sheets that separate tablets with the active ingredient. The sheets are successively eroded in predetermined periods of time and the tablets with active ingredient are released into the rumen. This type of SR-boluses enable the combination of tablets of different active ingredients that are released successively according to a schedule optimized for parasite control. Some devices are designed to deliver a strong initial pulse of active ingredient followed by a prolonged delivery at a lower dose. Others release a constant amount, etc. Slow release devices can be useful to protect pasture cattle and sheep that are exposed to re-infestation with worms during the whole grazing period. The parasites controlled by such low-release devices depend on the active ingredient(s) they contain. Most devices target parasitic worms such as gastrointestinal and pulmonary roundworms, tapeworms and flukes. Those with macrocyclic lactones target internal parasites such as roundworms as well as external parasites such as lice, mites and various myiasis, e.g. 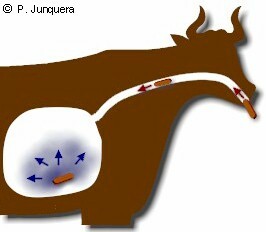 cattle grubs (Hypoderma spp. ), screwworms (Cochliomyia spp) and sheep bots (Oestrus ovis). A few ones are specific against horn fly larvae (Haematobia irritans) in cattle manure. Insect development inhibitors: e.g. diflubenzuron, methoprene; Used mainly against horn fly larvae in cattle manure. The basic benefit of SR-boluses or capsules is their very long residual effect that can last for up to 6 months. Protection of livestock is excellent and the repeated musterings for periodic treatment can be saved. A significant inconvenience of SR-boluses and capsules is the cumbersome administration, especially to cattle: they have to be restrained in a crush, and bringing the applicator gun down to the throat is not always easy. Another potential inconvenience is that depending on the composition, they are approved only for animals of a specific weight range (e.g. 150 to 200 kg) and assume a regular weight increase, which may not be always achieved, e.g. in case of droughts or other unexpected events that affect food supply. If the animals don't put enough weight in a given period of time they will be overdosed. The very long protection goes in parallel with extremely long withholding periods for slaughtering of up to 8 months! Metallic boluses are obviously not digested and have to be collected in the abattoirs after slaughtering. In case of unexpected slaughtering earlier than scheduled, besides the problem of withholding periods, the unconsumed SR-bolus (whether metallic or not) in the stomachs of the slaughtered animals may need to be recovered as well. In some countries where long-acting, highly concentrated injectable macrocyclic lactones are available (e.g. ivermectin at up to 4%; moxidectin at up to 10%) the use of SR-boluses has almost disappeared: this is the case in many Latin American countries.